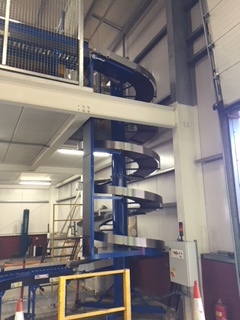 The spiral conveyor was installed in the warehouse at Copdock in October. The installation took two and a half days. Its purpose is to transport picked items from the Mezzanine floor down to ground level. The delivered goods are ready for the main warehouse order pickers to scan and add to their customer’s pallets. 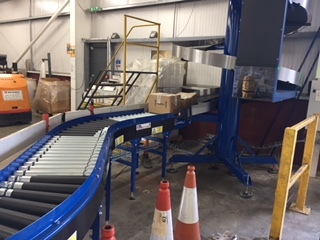 The Spiral Conveyor – Picked and packaged goods leave the working area on the Mezzanine floor destined for the Main Warehouse. This enables the warehouse team to complete ‘same day picking’ for an entire order. Where previously mezzanine stored items had to be picked separately the day before. This approach has improved efficiency, reduce damage and prevented errors. Reach truck drivers now no longer need to lift pallets of mezzanine picked items down from the upper floor, and pickers aren’t spending time looking through boxes and boxes of picked accessories. Also accessories are less likely to get lost in the transition from Mezzanine to Main Warehouse. 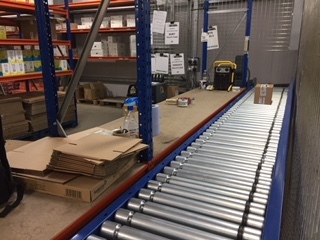 The Spiral Conveyor – Goods arrive in the main warehouse, packaged and ready to be added to the correct customer’s order.